Mild Steel, Stainless Steel, Galvanised Mild Steel and Brass. 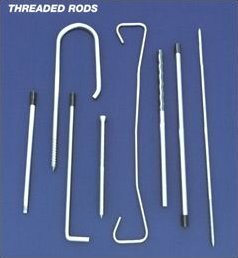 All threaded studs are also available with a knurl or bend on one or both ends. 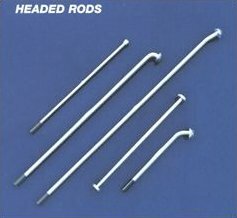 The headed rods shown here broadly represent the range of special heads available from Central Wheel Components Limited. Flat head, Mushroom head, Round head. 100mm to a maximum of 950mm Single or Double Ended.